Looking for a caring and professional Vet in Coffs Harbour? Look no further. There’s no doubt, Coffs Coast residents are animal lovers, and that’s why you deserve the best Vet in Coffs Harbour. We treat every kind of pet from all breeds of dogs and cats, through to birds and rodents, everyone’s welcome. 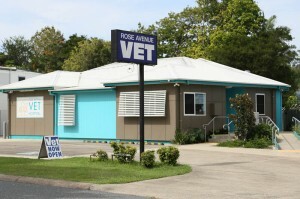 Rose Avenue Vet Hospital, situated off the Pacific Highway between the Clog Barn and the Coffs Showground, and Toormina Road Vet Clinic have provided health care for the pets of the Coffs Harbour region for over 20 years. Our service extends to all surrounding areas and suburbs of Coffs Harbour. Going North, they include Diggers Beach, Korora, Sapphire, Moonee Beach, Emerald Beach, Woolgoolga. And South and West, they include Park Beach, The Jetty, Boambee, Bucca, Nana Glen, Coramba, Karangi and Upper Orara. Firstly, at our clinics, our friendly and helpful staff will always strive for clinical excellence. And secondly, our facilities are custom built to provide your pet with the very best in modern veterinary medicine. But most importantly to you, our team is here to provide YOU with options and advice at every step of your pet’s healthcare. We understand that every animal is different, but we also understand that every owner and circumstance is different too. Above all, we promise to always listen to you, and help you find the best way of looking after your pet. You’ve found the best ‘Vet in Coffs Harbour’ but why use us? At both Rose Avenue Vet Hospital in Coffs Harbour and Toormina Road Vet Clinic, we provide outstanding caring service combined with state-of-the-art facilities. Listed below is our full range of services. Although your pet may appear to be healthy, regular pet health checks and pet vaccinations are very important. A thorough vet check by our Coffs Harbour or Toormina vet clinic may spot problems in the early stages before they become much bigger problems. All of our vets are kind, compassionate and above all, want to help you to do the best for your animal. This includes making sure you understand any problems your pet might have. Consequently, a thorough pet and animal examination will be carried out in the most caring and least stressful way for your pet. Our recently renovated Pet Hospital in Coffs Harbour has been custom-designed and fully equipped for the investigation and treatment of the majority of illnesses our patients present with. We provide expert tick treatment and prevention advice in Coffs Harbour and Toormina. Should your pet require immediate attention, our Pet Hospital can provide the best possible care. We provide caring and professional Pet Dentistry for your cat and dog in Coffs Harbour. It’s a fact that dental disease is one of the most commonly found problems in a consultation by vets, and is also one of the problems most commonly overlooked by owners. Because of our renovated and fully equipped Animal Hospital in Coffs Harbour, we are able to perform a wide range of surgical procedures all performed by skilled veterinary surgeons. Pet behaviour problems can be due to behavioural causes or medical causes. At Rose Avenue Veterinary Hospital in Coffs Harbour and Toormina Road Veterinary Clinic our veterinarians will fully investigate pet behaviour problems. We run a fun, safe puppy school from our Vet Hospital in Coffs Harbour. Rest assured, if you train your puppy early, you’ll get the best results later. At Rose Avenue Vet Hospital in Coffs Harbour and Toormina Road Veterinary Clinic we provide a quick and painless microchipping service. Remember, microchipping is the best way to have your pet found and returned. We provide a pet and animal grooming service at both Rose Avenue Vets and Toormina Road Vets. And remember, because we are able to sedate our patients we are also able to clip the more difficult to handle pets. We provide a boarding and daycare service for a range of pets including cats, dogs, birds, ferrets, rabbits, guinea pigs and rats and mice. Your pet can stay for as little or as long as they need to, from a couple of hours to several weeks.